The Demolition of the Pruitt-Igoe Building. "Happily, it is possible to date the death of Modern Architecture to a precise moment in time." Charles Jenks. After months of preparation, the first building was demolished at 3 p.m., on March 16, 1972. The second one went down April 22, 1972. The first stage of demolition completed on July 15. Pruitt-Igoe was a large urban housing project in St. Louis, Missouri. Architect - Minoru Yamasaki, who also designed the World Trade Centre, New York. Architectural Forum praised the layout as "vertical neighborhoods for poor people"
Each row of buildings was supposed to be flanked by a "river of trees"
By 1968 the authorities were encouraging people to leave. By 1971 it was calculated that the estate had cost $57 million yet had never been more than 60% occupied. By late 60s it was notorious: extreme poverty, crime, and segregation. 32 buildings were demolished in total from1972-4. Lots more info and links at Wikipedia, click here. Is modernity something we value or mistrust? 1900, Universal Exposition in Paris: the art of the new century already showed some telling characteristics: this was an art which seemed responsive to the new urban experiences of the modern city; there were artists who were fascinated with movement, change and speed; some of the art focussed on the body and sought a liberation from convention and restraint; there was also a sympathy with the poor and the dispossessed and finally there was a self-conscious awareness of the special nature of artistic production, in particular the posing as bohemian, radical or avant garde. We can say that an unconventional, experimental and at times revolutionary art developed. By mid-century it was being cited in the great conflicts of the period, the fight against fascism and the East-West Cold War. By 1960 Modernism, Modernist Painting, Modernist Sculpture had developed into a conventional set of attitudes and strategies. These received great critical and institutional backing in the United States. In the 1960s the cracks began to show: land art, performance art, installation art, minimalism, feminist art each presented a critique of the dominant narrative of modern art. Some writers have been helpful enough to give a time and a date: 3,32 on the afternoon of the 15 July 1972. 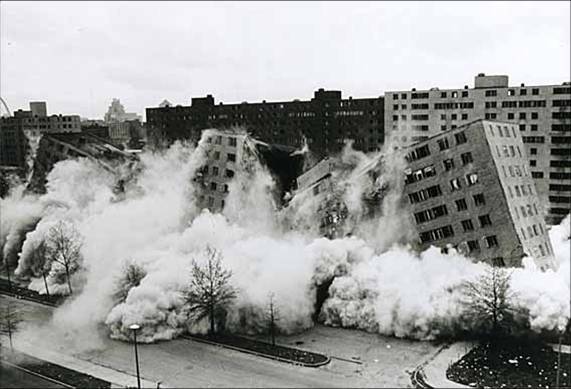 This day is important argues Charles Jencks because it was the day on which the first demolition of a tower block took place : the Pruitt-Igoe housing development in St Louis USA based on designs by the high modernist architect Le Corbusier. These were flats built to modernist criteria in which form and function were supposed to fuse, making the archetypal Machine for living in. In fact these and other developments were badly designed, badly maintained and un-loved by those who had to live in them or near them. The intervening years have been full of the noise of estates crashing down. New housing is more likely to be on a smaller scale, decorated in a more homely manner. Other writers are not so sure : they talk about post-modernism as something much more general. “A change of sensibility” according to Huyssens writing in 1984 and Jencks himself all but admits the inadequacey of simply giving a date by listing in his essay The Postmodern Agenda, some 38 key words or concepts which he feels have been altered radically in this new post-modern period. Or is it so “new”? Some theorists identify the post modern as an element of the modern: they argue that this idea of eclecticism and renewal was always one of the ways in which the modern renewed itself, that it is only high modernism with its blank canvases, silent music and curtain walls which sought to erase difference and plurality. These theorists (they include Habermas) confuse matters further by arguing over how long the modern has been in existence: since the nineteenth century, since the Enlightenment of the Eighteenth century, since the beginnings of commerce and industrialisation, or since the Rennaissance. In a sense this crisis over its identity and definition is in itself an element of the postmodern ( we are entering an arena in which the old certainities, the old narratives by which western man explained the world have, for one reason or another been placed in doubt and subject to crisis) . Harvey, David, (1989)The Condition of Postmodemity, Oxford, Basil Blackwell. Jencks C (1992-6) What is Post Modernism? London: Academy Editions. Taylor, B (2005) The Art of Today, London, Laurence King.